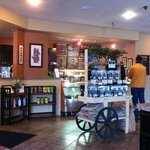 What a coffee shop should be - Arcedium Coffeehouse, Inc.
Review of Arcedium Coffeehouse, Inc. Description: Arcedium Coffeehouse, Inc., is located in Saint Charles, IL, and serves delicious, freshly brewed coffee, and scrumptious pastries to customers that need the extra boost to get through the day. You can count on a delicious breakfast, lunch, or snack when you combine our famous Java with our made-from-scratch pastries. Our selection is outstanding, and we hope you will come in to experience it. Call us for more information! Ask Jeff S about Arcedium Coffeehouse, Inc. Ask Kevin M about Arcedium Coffeehouse, Inc.
HIDDEN GEM! This is a weekly stop must for everyone! The smell inside of the fresh coffee is so invigorating! The employees are so nice and know exactly what you want without even asking. It's not expensive and the coffee definitely tastes better than the chain coffee houses nearby. It has a very cozy vibe and I love supporting small businesses that are local. Ask RippTrish about Arcedium Coffeehouse, Inc. They have many choices and the staff is super friendly and helpful, but...my oat milk latte was not that great, partners chai latte was super sweet and the quiche was microwaved and I question the freshness. Space is predictable. Not very interesting. Bad art on the walls but it seems clean. Might want to do something collaborative with some local artist to get some interesting art on the walls. Easy and builds community. Ask JennZ999 about Arcedium Coffeehouse, Inc.
Quaint cafe with delicious drinks! I had frosted mint got chocolate and it was amazing! Not overly sweet. This was probably the first coffee shop that didn’t make their drinks so piping hot you burn your mouth. They were perfect drinking temperature, maybe event slightly too much to the cooler side. Everyone else in our family enjoyed their drinks as well. The cashier was especially kind. It’s a little pricey but it’s a nice change from Starbucks with all the varieties they can make. Staff was kind and patient. Would definitely recommend stopping here. Ask toothfairy0904 about Arcedium Coffeehouse, Inc.
Been to Arcedium Coffeehouse, Inc.? Share your experiences!